Cats may be independent but it doesn’t mean that your cat can go ahead and feed themselves. House cats need your food provisions to survive, which is also one of the reasons why a lot of busy people find it impossible to care for cats as they need constant care. They also require a carrier for every trip if you want to take them on with you, which can take a lot of space. The fact that cats are creatures of habit that will demand their food at the same time every day will really prevent someone with a hectic schedule to opt to have their own feline friend. This makes having the best automatic cat feeder as essential as having a decent cat bed. 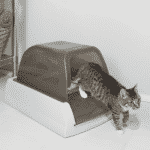 If you really want a cat, however, the best automatic cat feeder might just help you out. And if you like to automatize things, you should definitely check out our review of litter boxes that clean themselves! These products are designed to ease your pet parenting tasks, making caring for an animal companion simpler and fuss-free despite your hectic schedule. Learn more about these nifty devices by reading on. The best automatic cat feeder may seem excessive for some people, but if you have a busy schedule, it can be a lifesaver. An automatic cat feeder will be more reliable and can ensure that your cat is well-fed and happy whatever you may be doing for the day. These appliances are also excellent tools to keep your pet in good shape. As most cat parents like to spoil their fur babies, a lot of house cats are seriously overweight. In fact, the Association for Pet Obesity Prevention notes that 59% of American cats are obese. As parents can’t resist their cats’ charms, it’s easy to overfeed them and try to make amends by trying to justify their actions later on. The best cat automatic feeders will not only schedule your pet’s regular meals, but it can also help you control their portions without feeling bad thinking that you’re starving your pet. This makes it an essential for most pet parents, especially those who try to compensate for not being able to spend time with their pets with food. Cats have their own feeding schedule and you have to stick to that to keep them happy. So, you need to be able to program the feeder to dispense food at the right time every day to do your duty as a pet parent even while you’re out of the house. Cats are smart and love to eat so you have to keep them out of the food container to keep them in the ideal weight. Look for a unit with a tightly closed and secured lid to prevent prying paws from getting into the food. Again, cats will try their best to access the food so to keep them out, you have to choose a unit with a secure dispensing spout. As feeders are often electronic, you’ll want something that won’t use up a lot of electricity. This will ensure its cost effectiveness even if you have to leave it on for the whole day. These are just a few important features that the best automatic cat feeder should have. Stick with these and you’ll find a useful device to help make your pet parenting a breeze. First on our list of auto cat feeder reviews is a fully automatic and programmable cat feeder: the PetSafe healthy Pet Simply Feed Automatic Feeder. This unit looks a lot like a coffee maker, making it a great fit in a lot of homes. It won’t look completely out of place in your kitchen and you can be guaranteed that your pet will be fed on time, even if you’re not home. What makes this product a big hit is its several feeding modes. You can set it up to release food in different ways, ensuring that it will suit your cat’s needs. 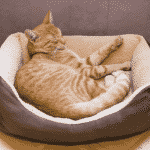 You can choose to feed your kitty twice a day and set it during specific times of the day. You can also set it up to release food for up to 12 times a day, depending on how often your cat likes to eat. If you’re worried about overfeeding, fret not. 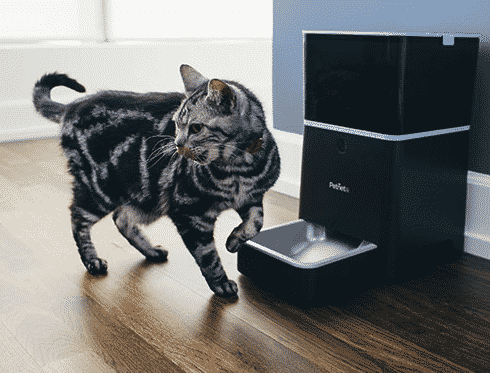 Portions can be easily controlled with this automatic feeder as you can choose to release from ⅛ cup to 4 cups of food at a single release making it easy to manage your cat’s weight even while you’re not at home. There’s even a Slow Feed mode so your cat won’t scarf down quickly, preventing choking, bloating, and vomiting. You can also choose to instantly release food with the Immediate Release function. Equipped with a locking lid and a secure food dispenser part, this will ensure that your cat’s food is kept safe from prying paws and fresh all the time. However, it’s only meant for dry and semi-moist food, so if your kitty thrives on raw or wet food, you might need to look for something else. Another product considered to be the best programmable cat feeder by some folks is the HoneyGuaridan A25. This unit is actually pretty entertaining as it has a robotic vibe to it, thanks to its very modern appearance. It can contain up to 3.3 lbs of dry food, so you won’t have to worry about having to fill the unit every day, making it even more convenient to have around. Like other automatic feeders, you can program this unit to release food at specific times of the day. You can opt to feed your cat for up to six times a day, depending on how frequent they are used to eating. You can also set how much to feed them as you can set this unit to release from 1/32 cup to 4 cups per meal. What makes this unit stand out is its ability to record and playback a 12-second recording. It can be of your voice or any sound that you want and it will be played before the food is about to be released. As the unit is designed for both dogs and cats, this feature is primarily to get your pet to go to where the feeder so the food won’t have to sit out and get stale before your fur baby gets to it. If you’re opting for this product, though, make sure to stick with dry food with pieces that aren’t bigger than a centimeter in size. This is so you can be sure that the bits won’t get stuck in the hole and prevent the automatic operation of the unit. Some folks might prefer a complete feeding setup for their pets as hydrating your cat is highly essential. Leaving just a dish bowl full of water is not enough, especially since there’s a chance that your cat will knock it over and create a good, wet mess at home. This is why we included the Diamond Series V3 pet feeder in our best automatic cat feeders list as it also comes with a detachable water dispenser for a complete mealtime. Aside from the nifty addition, the feeder itself is a great option worth considering. It has a clear food container that can hold up to 4.4 lbs of dry food. It’s not much, but at least you can easily know when it needs refilling. This unit is also equipped with a backlit LCD screen that will let you set the feeding time (up to 4 times a day) and portioning (up to 2 cups) for your pet with ease. It will also let you keep track of how many meals your cat had, letting you rest assured that you’ve set the unit properly and that your kitty won’t be starving on a regular basis. Another standout feature for this unit is its ability to handle disc type prescription kibble. Other automatic feeders have small holes to ensure that your cat won’t be able to access the food inside, so they can’t dispense such items. This makes the Diamond Series V3 a good option if your cat needs to stick to a very specific diet. If you liked how the Pyrus feeder looked like but want a similar option for additional choices, this Homdox product is for you. It looks just like the previous item in this list with a clear jug-looking food container and a stark black base, giving off a utilitarian feel for pet feedings. It can hold up to 5.5 liters of food and is completely programmable for automatic meal times. Like the other feeders in the list, this unit can also be set to dispense up to three meals a day. You have to set the time and amount of food that will be released for every meal time so you can be sure that your fur baby will get the nourishment she needs even while you’re busy or away. It’s easily a great product for cats as it fosters their independence but will still ensure that they’re in top shape no matter what. Equipped with an LCD screen, programming the desired schedule and food portions are also very easy with this feeder. You can even monitor how many meals were dispensed as it has a counter on display as well. This guarantees a quick and convenient way of pet parenting. This product is possibly the most traditional looking feeder in the list as it makes use of a clear food container and a simple black base. But don’t let the simplicity fool you as this can be a very reliable appliance for keeping your pet well-fed even while you’re away or in much need for more sleep. Made with durable ABS plastic material, durability is guaranteed with this unit. The feeding bowl is also attached to the feeder’s machine, so you won’t have to worry about your pet dragging the dish elsewhere and not putting it back in place for the next feeding. You can remove it, however, for easy cleanup. Its design also guarantees the food’s freshness as the container is closely sealed. As for its automatic features, this product is equipped with an LCD screen that will let you easily set it up. You can easily see the mealtimes and food amounts that you want to set for your cat. You can preset up to three feeding schedules and select the portion you want it to dispense. Like the HoneyGuaridan A25, this unit can also record your voice or other sound clips and play it back during mealtimes. This makes it a great feature for dogs, but it can also work for cats as well. What makes it stand out, however, is its large food capacity. It can hold up to 7 lbs of dry food, so refills won’t have to be as often if you don’t live in a multi-cat household. Not a fan of fussy-looking things? Mixing minimalism and functionality is the Cat Mate C3000. This automatic pet feeder is made to help you schedule your pet’s meals so you can be sure that they’ll eat on time even if you’re not home. With its clean lines and colorway, this product looks like a kitchen appliance with a food catcher on the side, ensuring that it will blend in well in your home. It can hold up to 6.5 lbs of food and can release a minimum of 2 teaspoons of food, making it ideal for overweight cats that you need to put on a diet. As for its food dispensing, you can press a button for instant food release or set it up to dispense food for up to 3 times a day. It also has a “Frequent Mode” which will make it dispense food several times throughout the day for pets with special dietary needs. Setting up this unit is fairly easy, thanks to its LCD screen. It also displays your battery’s power level so you can always ensure that your cat will get her meals on time no matter what. To avoid having to set up the unit all over again, all you need to do is to replace the batteries in 60 seconds and it will work seamlessly with its initial settings. As its components are dishwasher safe, this unit ups the convenience you can enjoy from the best automatic feeder for cats. You won’t even have to manually wash its parts, so you won’t have to squeeze in tedious cleanups in your busy schedule.